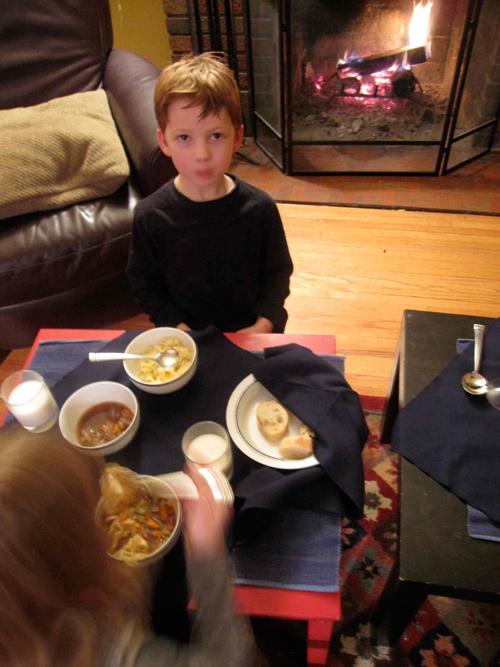 We are in comfort-food / stay-at-home mode here. Maybe it was the furnace going out, or maybe more likely my neck going out, that had got me flipping through past Martha’s for dinner inspiration this past weekend. Food that really warms the soul, makes us happy to stay inside to do prep work and finds us enjoying it fireside, encompasses the best of what my selection, Boeuf Bourguignon, has to offer. 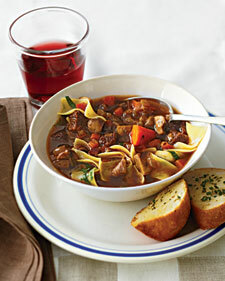 Martha claims this recipe to be the merger of the oh-so-french boeuf bourguignon (the glamour and gorgeousness) and a humble pot of beef noodle soup (practicality, made from pantry and fridge basics). Prep took at least 30 minutes with all of us working and just over 2 hours (the recipe says 3 hours, but I cut the ribs prior to step 4 to make a 6:30 dinner date). And so we began. My aspiring sous chef’s (technically that means “under chef” in French), ages 5 and 7, played a big part of this classic French dish. I used to shy away from multi-ingredient recipes. This one had 15 and stated 30 minutes of active prep – many of the ingredients suitable for the sous’ (plural for sous chef’s in English?/ pronounced sues?). You’ve got your long veggies like carrots, celery and shallots and soft button mushrooms (that a regular kitchen knife can cut) along with time-consuming de-spriging of the thyme, all using the sous chef’s skills. That left this head chef in charge of the short ribs and bacon. 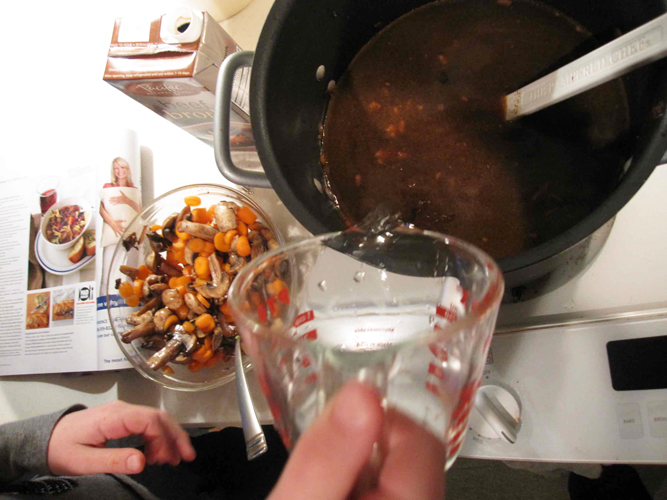 The kids handled the pouring (stock, water and red wine) and spreadable tasks (French bread with butter, chives and horseradish) with ease. As we channeled our inner Ratatouilles — my son actually placed his hand over mine while I chopped some veggies (I drew a line at the hair pulling) — we were reminded that anyone can cook and that cooking should be enjoyable. 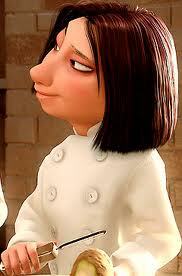 I do the Ratatouille Colette bit – “No! You waste energy and time! You think cooking is a cute job, eh? Like Mommy in the kitchen? Well, Mommy never had to face the dinner rush while the orders come flooding in, and every dish is different and none are simple, and all different cooking time, but must arrive at the customer’s table at exactly the same time, hot and perfect! Every second counts and you CANNOT be MOMMY!” They pick out their parts to play – the lame Linguini and the Remy, the rat with the overly-sensitive taste buds. Still role playing, we set up a candlelight dinner in the living room by the fire, despite the previous night’s occurrence of a half-cup of hot red candle wax jettisoned from its candle container (I will save that for a Martha homemaker challenge that I would assume involves a hot iron, a wish and a prayer). I call the sous chefs who are suddenly servers, to the kitchen to get the steaming bowls of noodles and soup out to the customers. We do a half-loaf of plain bread and a half-loaf of the full-on horseradish bread for the adventurous table and the tables are set with dishes to match the ones in the Dec 2010 MS Living issue (seriously!). One customer is unsure about the combo and is allowed to have a bowl of noodles and a bowl of broth (a cop out, but bread dipping and a small tasting happen). We talk about going to Paris for quite awhile. Seconds are had. When finished, the recipe for six turns out a lot of leftovers. Some go in the fridge for the week and some go in the freezer, in case the furnace goes out again and we need some comfort. I also feel like a Ratatouille viewing is in order, but it’s too late for a school night… maybe with leftovers on Friday? Or I could go solo with another viewing of Julie & Julia. Lots of options and pairings for this great dish that holds the best use of the sous chef’s skills. bon appétit, petits chefs! The most interesting thing in life going on right now is a trip to the dentist. Truly reflective of the season of January in a northern climate. The chilly temps coupled with the renewal that the new year brings finds me with calendar on laptop, scheduling all sorts of appointments — even for stuff I don’t need. Just scheduling, that’s my main agenda. Looking back at 2010, the kids’ dental hygiene was not stellar. I don’t want to undermine their efforts – they were brushing twice a day, I swear! The first visit of 2010 to our children’s dentist occurred in April. April was warm, sunny and full of optimism. Calvin, my 5-yr-old, walked into the dentist like he owned the place. Confident in his smile. 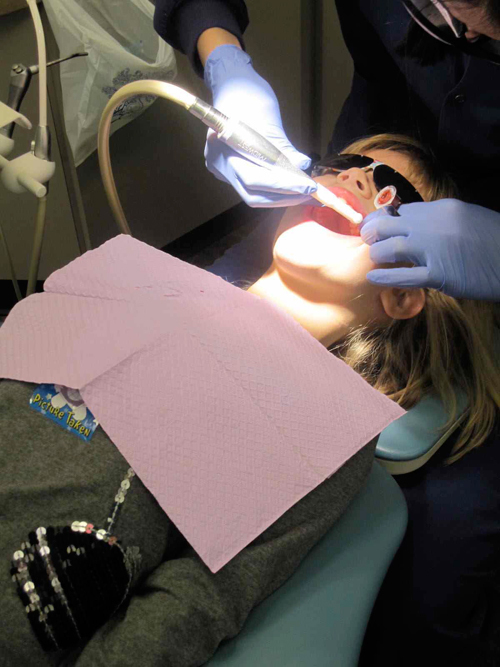 Ava, my 7-old-yr, had a small cavity at age 5 – – the needle of novocaine a distant memory for her. She had no expectations that the dentist would be any less than praiseworthy after a quick check. It had been eight months since we’d been in. The dentist’s office boasts an open floorplan, meant to be fun, full of light and welcoming for children and accommodating for parents who need to sit nearby and witness the whole appointment go down. Which I have done for four years now. At the same time they filled Ava’s cavity in ’06, they also did a capping of all the teeth – – a preventive measure. She has always sailed through with flying colors, toys and stickers. Calvin, in 2010, was a different story. In our April appointment, he was held up in x-rays and the review of them with Dr. Sally was even more discerning. As the x-rays told some startling truths, I watched a very uncomfortable Dr. Sally break the cavity count to me in a slow, painful way. At first, “There are four cavities here.” …a pause, more assessment of x-rays on the light box, “and there are a few smaller ones on each side.” Me incredulously, “What – he has six cavities?” The butterflies floating from the ceiling turn unfriendly. “Yes, well… there are a few here and a few here…” pointing to the lightbox. This goes on a while, the pointing, when I just have to know “How many?” … dejected and possibly worried that I might lose it she confirms, “Eight.” Silence. I look at my innocent little boy with his mouthful of brushing or over-indulgent sweet teeth gone wrong and immediately believe I have failed as a mother in this way. The kid is going to need four consecutive trips to the dentist to fix this mess – two will be dealt with on each trip. Three teeth are actually going to get silver caps. How terribly sad. 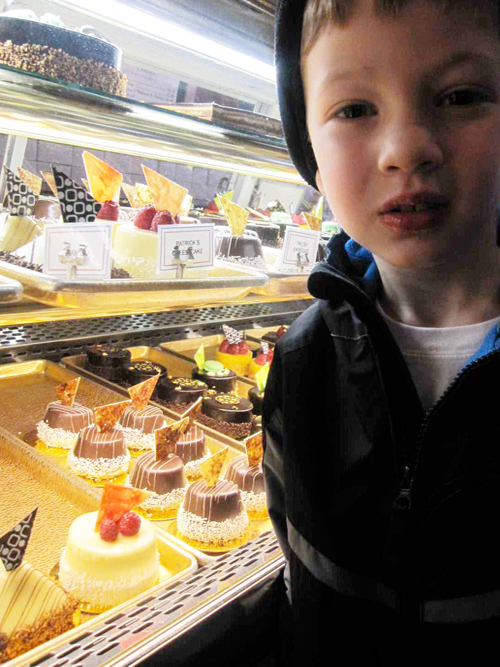 He’ll be looking at those til age 12 (the 12-yr molars). Oblivious to his four-appointment sentence, he picks out some toys, slaps on a sticker and we’re on our way. I will spare details of the four trips only to say that by trip number four, they have no other kids in the appointment room – six empty chairs. He tried to be so brave, bottom lip quivering, but there is no trust left at the end. Calvin is a questioner. He now demands of Dr. Sally, “how can you live with yourself… telling kids lies?” He wants to know how she ended up being the type of person she is. She handled it well – the hygienists were also pretty amazing (they are in general, I can say because my mother-in-law is one). The four-appointment series ended in July and I forced myself to schedule an appointment for future at that moment. We cry a lot, prep for the return visit four months later, only to find out we need to reschedule (see alternatives for a missed dentist appointment here). Finally, we make it back. I don’t plan to entice proper behavior with rewards, but after they behave really well I can’t help but warrant a stop at Patrick’s Bakery. 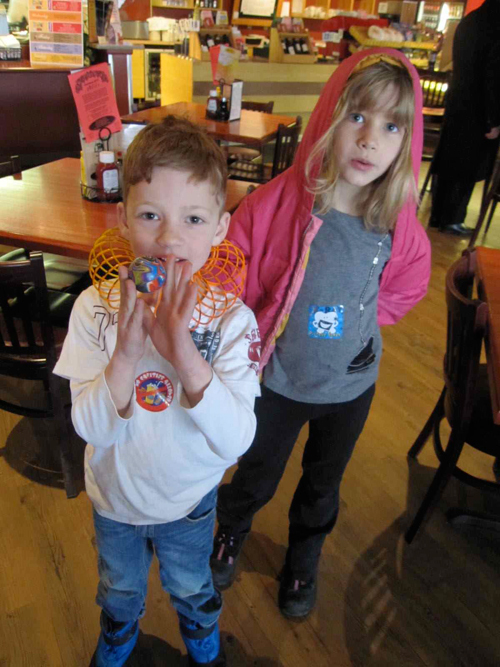 They tout their toy (an orange slinky) and stickers “No Cavities Allowed” (a red circle and line strike out over bad foods) and “Great Picture Taken” (with a happy tooth and x-ray) while I continue on the NO cavities proclamation high. We indulge in a savory breakfast and get a sweet treat from the deli to go, pending careful teeth-brushing post-treat later that eve. I can’t bring myself to Google “poor enamel” or try to find out if genes play a part in this twisted fate – one child is going to have good teeth (taking after her father) and the other problem teeth (taking after me). I’m sure of it. Maybe we could even cut back on sweet treats… naw. 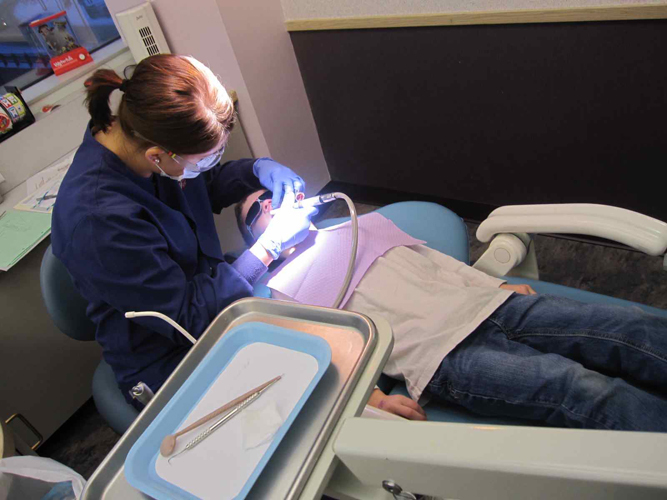 We started doing more after the fateful series of appointments – ACT for rinse, more flossing (although not nearly enough) and parent-supervised brushing (which I relearned is critical until at least age five). I hope the dental gods will smile upon us at our next semi-annual. At least until braces come along. Note: Officer Flossy is the “toothfairy” in these parts, a derivation from the Officer Flossy character of the beloved Richard Scarry books with Dingo the Dog at the root of all trouble. Language, or as this momie’s daughter might spell as Langwich, is “the communication by voice in the distinctively human manner, using arbitrary sounds in conventional ways with conventional meanings; speech.” So language is the spoken word and how that gets translated into the written word, well that would be the art of writing and in technical terms spelling. As children go through an absolute absorption of everything they learn, specifically during the ages of 3-6, known in Montessori as the Children’s House, they should be encouraged to explore their world using their senses. 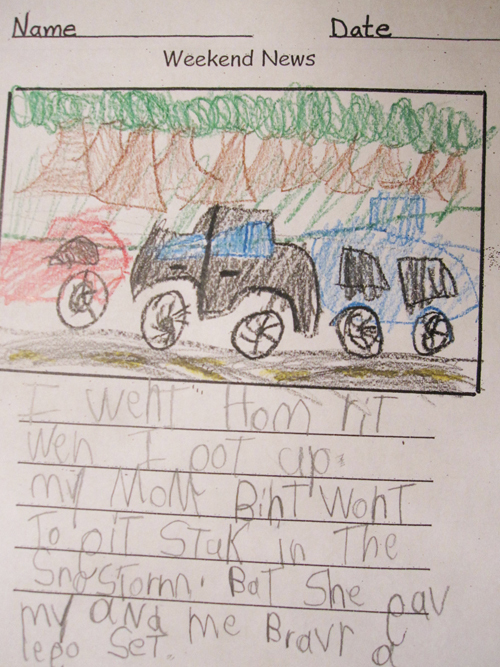 A parent might only measure progress by how well a child can write or read. They might be very concerned to see school work and papers coming home that have backward numbers and letters, with incorrect spelling of words being more the norm than correct. At first, I too was concerned. Until I began to revel in the discovery of new words along with them and began to appreciate the forces at work behind the scenes. What connections were they really making beyond what was measurable to me? Who decided it would be language, not langwich anyway? Say it referencing both spellings, you’ll find subtle variations at best, nearly the same word. Vowels are commonly missed. Okay too because a lot of them are silent. Between my 5 and 7 year-old, they both have distinctly different learning paths. Each of them have been exposed to and benefited from Montessori instruction at Augsburg Park Montessori School – one for one year and the other in his third year. 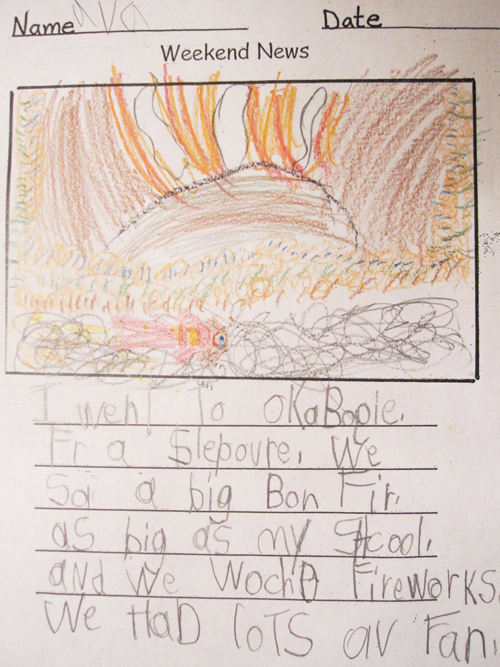 My daughter’s more casual approach to spelling and her teachers and our willingness to not force it upon her, has allowed her love of storytelling to blossom. What if we had hovered over and corrected her every word? Probably not so much interest and impending frustration. My son, on the other hand, an absolute rule follower and borderline perfectionist and whier (my definition for kids who constantly ask why, often accompanied by crying and whining), isn’t ready to delve into storytelling and writing so much because he gets hung up on the correct spelling for everything. However, I don’t worry so much about this. He’s learning in leaps and bounds in his own way. Thus my point about allowing exploration on the part of the child and rediscovery on the part of the adult. If parents can let go of testing results, comparisons to other children and just support the child developing their own strengths, the rest in theory should come along. Also consider the degree to which all of their senses are engaged and learning on a daily basis. Montessori tools they’ve received at their school allow for a complete sensorial experience – tracing the letter “a” made of sandpaper doubles the learning effect of repeating “a” after the teacher. I so enjoy when I can be puzzled about a story of Ava’s when I read it, missing the meaning because of incorrect spellings, and she picks it up (even if just revisiting it after months) and breezes right through it. As if to say, duh, can you not read? Most of her stories coming home from school are a weekly things they do on Monday’s called the “Weekend News.” I recently revisited some of these from her first grade year. And there’s many more. 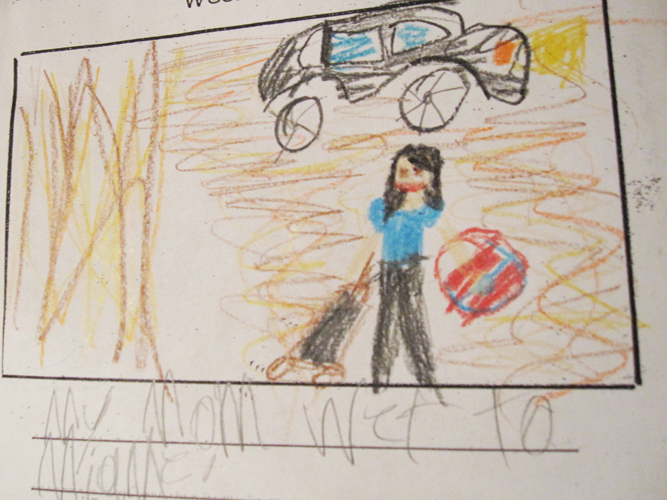 I especially liked the one where all it said was, “My Mom wet to Miam” – (Picture 3) that would be the February weekend I went to Miami while they experienced record lows. She accurately dressed me in pants and long-sleeves on the beach. There is no record of what went on at home with daddy. Enough said about that weekend. So the next time school work comes home like this, delight in the misspellings and storytelling that are the Sekrit Langwich of children. With any luck, you can discover something new that is delishus for grown-ups too! Venturing out in the winter in a northern climate takes a mind over matter approach. 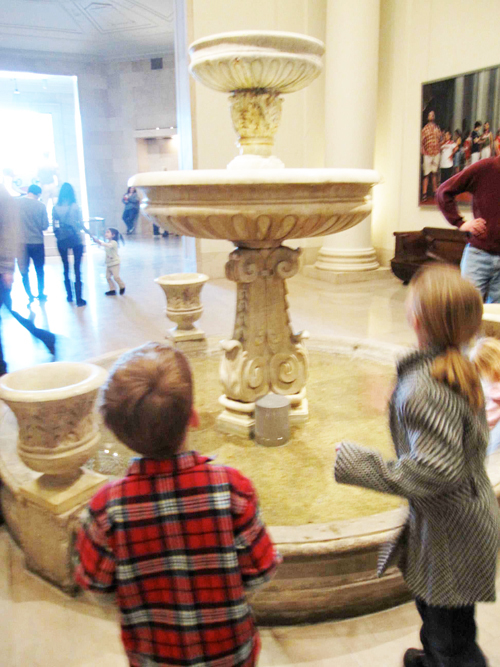 On this particular January Sunday, we had planned ahead of time to visit the Minneapolis Institute of Arts (MIA) for their second Sunday Family Day. Earlier in the day, my 5-yr-old cried outside of church while still in our car, claiming to be so frozen he could not move, “God’s house is a cold place.” I was preparing for what I thought would be a tough sell – – heading to MIA – when the sugar-high from the massive donut at post-church hospitality kicked in. He was optimistic and ready to go despite the cold (it wasn’t that bad at a mild 15 degrees). I’m now a whiz at getting in and out of there – this would be the third time in a week and a half that I had visited the MIA. Once to see a play at the Children’s Theater, once for Art Adventures training and finally today for free Sunday. We are fortunate to have MIA as part of Minneapolis’ arts and culture scene. It’s even better that, as many museums do around the country, days are set aside for people to come to the museum at no charge and take advantage of the activities, performances and learning they have to offer. 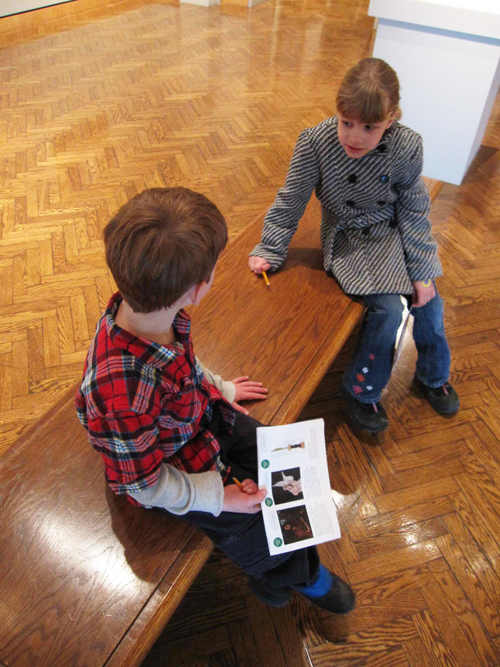 We often go to the Walker Art Center’s first Saturdays too. These can be very busy days at both, but getting in early is better. MIA’s Family Day is 11:00a.m. – 5:00p.m. Our family of four visited between 12:15 – 2:00. All of the work the program coordinators must do for these days pays off. The MIA is so huge and could be overwhelming without some direction, especially for kids. 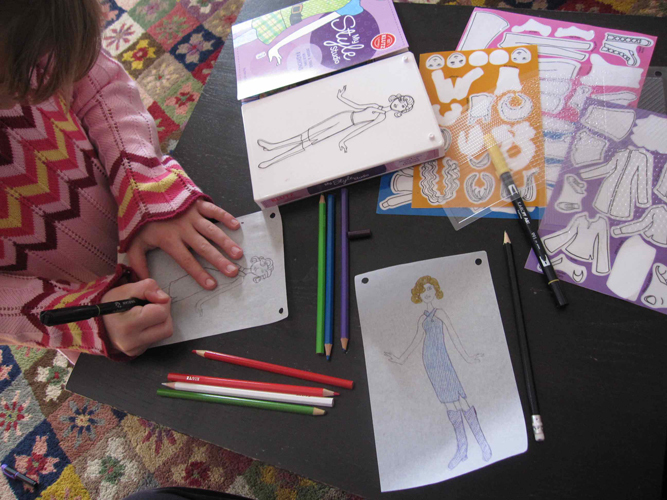 For art to be appreciated by children, it needs to connect with them in many ways. 1. Make it relatable. Today’s line-up offer performances by dancers from Ballet Royale Minnesota, who were invited and told of the days theme – Wings – stories, performances and activities about birds, wings, angels, dragons and such. The 3 sets of dancers ages 11 to 14 took the theme, selected from photos of artwork MIA had sent them, and created their own story about the artwork and coreographed their dance numbers. The captive audience of kids and adults enjoyed the performances, lasting about 25 minutes total. The young dancers made it seem that all kids could do something like they did. 2. Make it fun. Activities included mosaic-making, puppet-making, guided tours, dance performances and workshops. Today with my ADD husband along, we chose one activity that we’d never before done at previous Family Day – the Gallery Hunt. He was good with maps, so we assigned him the job of map-reader for the Take Flight Gallery Hunt along with the answer key. Calvin was very determined to make it to all 6 works of arts on two different floors. 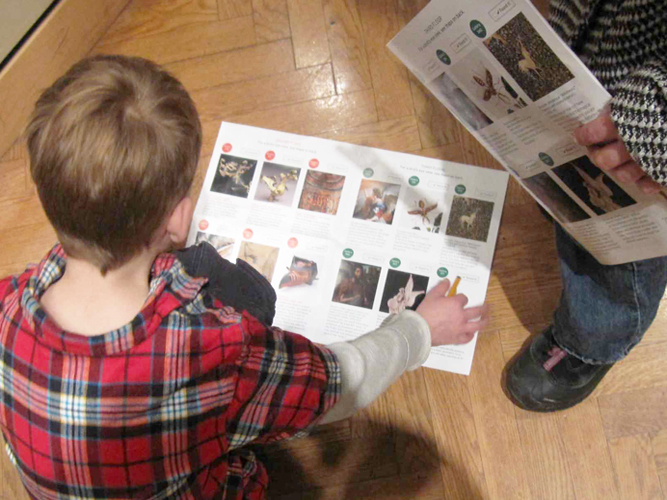 The kids had worksheets they took with them, marking found works of art off as they went and beginning to understand how areas of the museum are organized. 3. Make it interactive. All of the works related back to the theme, allowing for comparing and contrasting ideas, a method they really seem to respond to. And mixed media like films (for Richard Hunt’s the Transformation Mask, 1993) and fabrics and works of art meant to be touched, heightened the experience. I did get in a few follow-up glimpses of the works of art I’ll be talking about at my daughter’s school through their Art Adventures program. 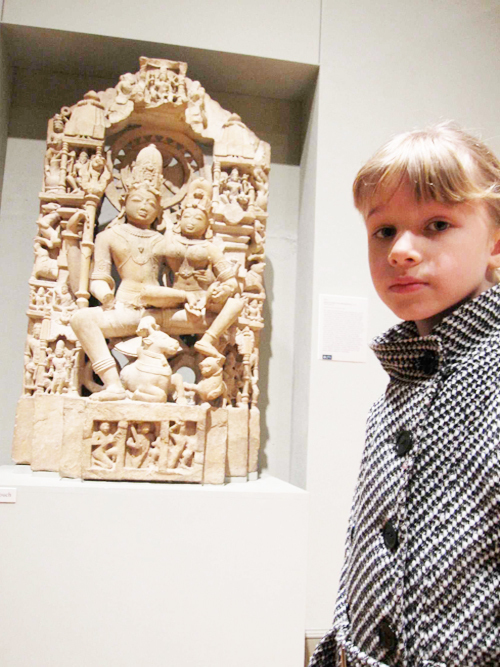 There are ten curriculum themes, each theme with eight works of art. Last year our school did Sources of Strength, this year it will be Family, Friends and Foes. We checked out Shiva’s Family for awhile in silence (at left). I’ll be studying up on four works of art for Art Adventures and certainly, we’ll be back for another Sunday Family Day at MIA. We Heart Art. 12: Ikran Dragons: the Ikran is the skyhigh-flying dragon in Avatar. I am about a year late to the table with this observation, but I was unsure of the kids’ readiness to comprehend this movie. Us parents screened the whole thing (2hrs 40min over the course of two nights) and finally gave in by break day #12. The kids got to watch it. I fast-forwarded through the battle scenes and did a lot of pausing and explaining. Worth it. 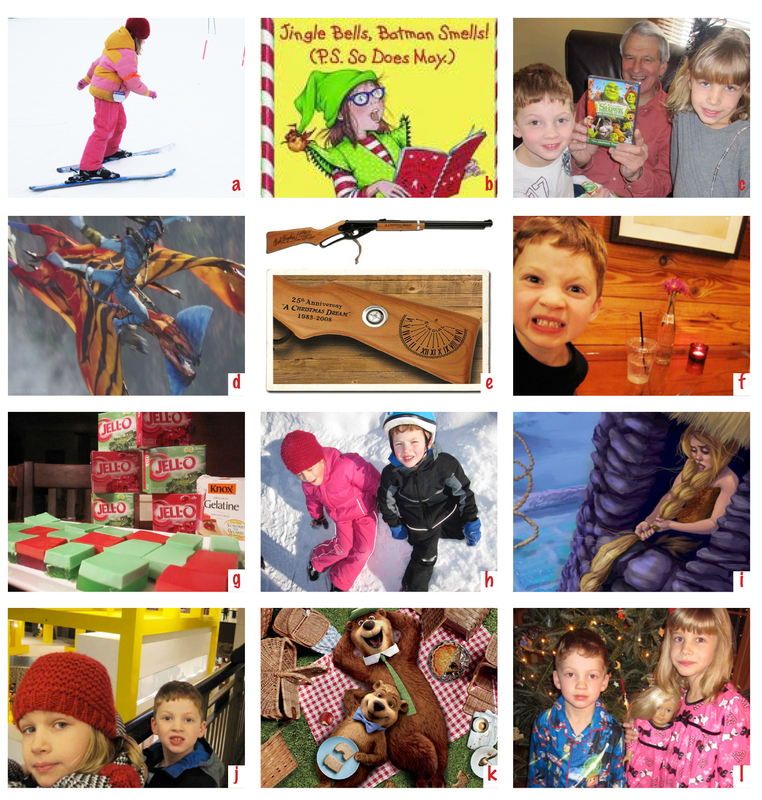 11: Pairs of PJ’s: What is it about grandparents and PJ’s (…and Herbergers I might add)? I am thrilled – the kids are now stocked for the year. 10: Runs down Buck Hill: First skiing lessons for the kids. Ava, my 7-yr-old, just went with it. Calvin, the 5-yr-old, questioned the best way to do everything and by the mid-point of the lesson (from our indoor vantage point), we could see him wildly gesturing to the big hill. He would not be left behind. Ava loved it so much she felt compelled to call her uncle and do some trash talking about how easy it was for her and too bad all he knew how to do was bomb the hill. 9: Red Ryder Rifles: After blogging in an earlier post about comp tickets from Sweet Retreat to see A Christmas Story, turns out Snowmaggedon did prevent us from making the Saturday, December 18 show (they did actually have the 2:00p.m. show, just not the 7:30p.m.). We rescheduled for December 29, a perfectly sunny outdoor day for ice-skating as it were. The play was a treat. There is not a bad seat in the house (we went from third row from stage to third row from the back) at the Children’s Theater. Anyway, Ralph, the older boy in the story, mentioned his dreamy Official Red Ryder Carbine-Action Two-Hundred-Shot Range Model Air Rifle 9 x 90 times. 8: Sweet Italians: Number of slices of our Pizzeria Lola Sweet Italian pizza. This new neighborhood joint knows pizza, beer, wine, ice-cream and atmosphere. On a Thursday night, we waited for an hour to be seated. It was packed. To stave off hunger for 5-10 minutes, the photo booth awaits. We also tried the Butternut squash, spaghetti squash, brown butter, Taleggio & sage pizza – yummy. When given the soft-serve ice cream choice of vanilla or pistachio, Calvin confidently ordered the ‘stacio. Also good stuff. 7: Jello Knox Blox: See my Dec 24 post. 6: Tangled Rupunzels: Grandparents took the kids to this one. My Dad loved it. I have nothing to add. 5: Figure-eights: Last year, we did indoor ice-skating. Sunday, December 26 was sunny and perfect for outdoor ice-skating. We headed to a nearby park where only a few other skaters were. Ava, the more cautious, aimed not to fall. Calvin, now free of the “walker,” aimed to fall as much as possible at high speeds. I skated with them. We all ended up in the snow banks surrounding the rink from time to time. 4: Pic-a-nic Baskets: Yogi Bear. I knew I couldn’t stomach this one in 3D (I think 3D in general doesn’t work for me). We found a non-3D version at none other than the MOA and I had to convince my daughter to go. Movie was what you’d expect and it entertainingly passed the time, but I didn’t hear much post show. Three days later, my son is talking like Boo-Boo. 3: Rumpelstiltskins: This would be the home viewing of Shrek 4. The kids were thoughtful enough to get this for their Papa for Christmas. Rumpelstiltskin has three wigs he calls his servants to don, based on the situation, his mood and temperament: business wig, victory wig and angry wig. 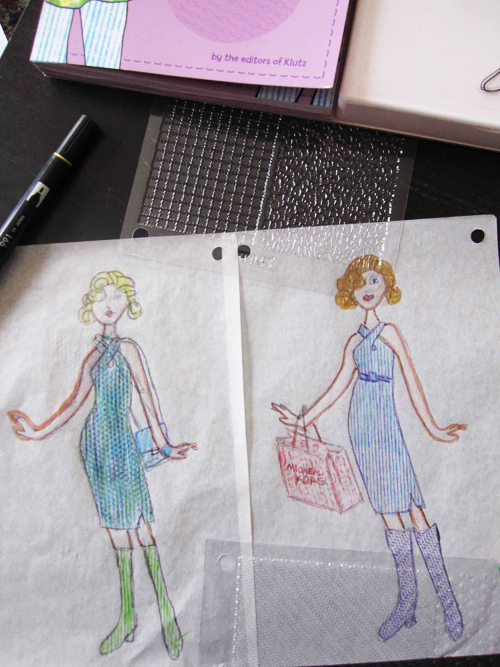 Part Pinball Wizard meets Marie Antoinette, girl.com notes. 2. Trips to the Mall: I’m sure it was more, but two the kids actually liked. MOA for Legoland and Southdale for Tangled. While people tweeted and facebooked away about being super crazed to venture near one local mall in particular, I found it not to be a worry. I think I’m outnumbered. 1. Squeezy Burp from Junie B. Jones: We went to this play prior to Christmas at the Hopkins Theater. Talented little actors and Junie B. was all Ava and her friend had imagined she’d B. It’s a good starter theater for kids – shorter play run times and no intermission, plus reasonably priced at $12. A much better deal than the coveted Squeezy Burp (think whoopie cushion) that Junie worked hard to round up $5 to buy for herself for Christmas, which she eventually gave to her arch enemy, May. This Holiday Breakdown brought to you buy one tired parent who now needs to catch up on some sleep.